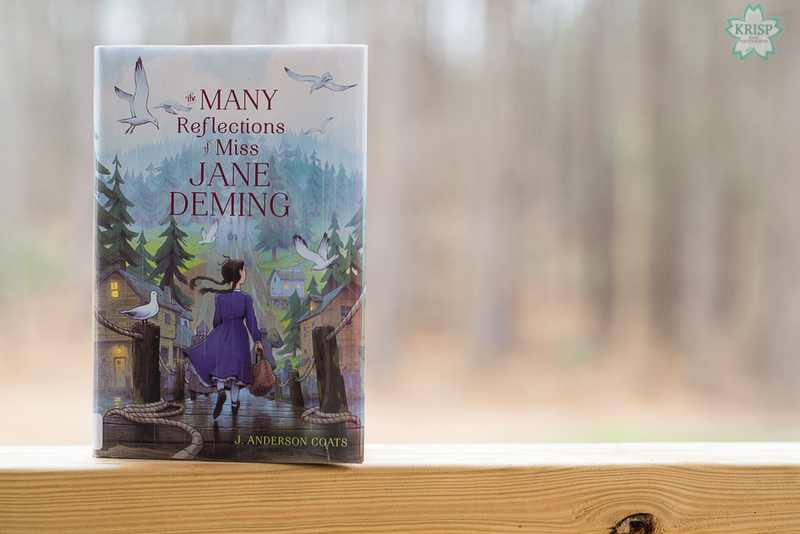 The Many Reflections of Miss Jane Deming by J. Anderson Coats is a historical fiction novel for kids. It takes place in the United States just after the end of the Civil War. 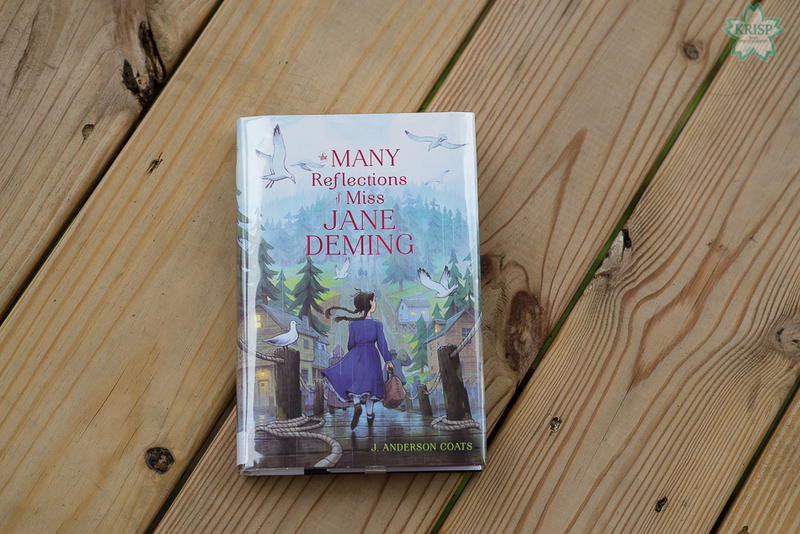 The story is about 10-year-old Jane Deming, who lost her father to the war, traveling with her step-mother, Mrs. D and younger brother Jer, to Washington Territory. Jane calls her step-mother “Mrs. D” and when the story begins, Mrs. D is working to support Jane and Jer while Jane stays home to babysit her brother. The reason Jane doesn’t have to go to school is because Mrs. D doesn’t see the usefulness of having an education, therefore she would rather Jane stay with Jer. Jane has other chores to complete while she is watching Jer such as washing clothes and dishes and scrubbing the floor. At the time Mrs. D is working, they are staying at a hotel while they wait for Mr. Mercer to find (and afford) a boat he can charter to transport them to Washington Territory. During this long waiting period, Janes reads the pamphlet Mr. Mercer handed out many times and has most of it memorized. Jane talks about how she misses going to school and her friends, but doesn’t enjoy getting looked at with pity because she no longer has her biological parents in her life. She is looking forward to starting a new life in Washington Territory where she’ll be able to go to school, nobody will know her past so there won’t be any pitying looks and Mrs. D can get re-married like she wants to. After staying at the hotel for many weeks, Mr. Mercer announces that he’s found and chartered a boat to transport the girls, widows and children to Washington and to be ready for departure in two days. Packing doesn’t take long and soon Mrs. D, Jer and Jane are on their way to Washington. During the voyage, Mrs. D, Jane and Jer all make new friends; Jane becomes an ‘invigilator’ for Ms. Gower who actually uses it as an opportunity to teach Jane. Ms. Gower offers to pay Jane for her work as an invigilator since Mrs. D was concerned about finances and thought it would be useful for Jane to spend her time knitting socks for them to sell when they arrive in Washington. It takes a couple of weeks, a few stops in a couple of different ports along the way and a longer stop in San Francisco before they finally arrive in Washington Territory. Jane and Mrs. D are disappointed by what is there and what’s not there; Mrs. D was hoping to re-marry a banker with a nice house, good job and keep house like she’s always wanted. Jane was hoping Mrs. D would be able to re-marry her banker and most importantly, she thought she would be able to attend school. However, they both soon find out that there are no single bankers waiting for the girls to arrive or to marry. Jane finds out that there are not always schools for children in Washington to attend. Many of the Washington residents are disgruntled and many of the voyage’s travelers are disgruntled with the empty promises made by Mr. Mercer. Although Jane makes new friends in the territory while maintaining her old friendships with her friends from the boat, she is working to hide her disappointment about the lack of schools. Eventually, Mrs. D re-marries one of the numerous bachelors who sticks around to waiting in the parlor to find a woman to marry and whom befriended Jane when they first arrived. He is a nice older gentleman and a welcome change in their lives. He lives on the Eastside which is across a lake which he takes a canoe to get to and from. Jer and Jane have a dad now, Jane can attend school as long as she comes up with the money to pay for it and can spend more time with her friends. Jer learns to catch rabbits and gets to play outside alone now. Mrs. D gets to keep house like she’s wanted to; Mr. Wright teaches Jane how to make a canoe, care for a garden, set and check traps, skin an animal, pull a canoe, tell the direction she’s traveling and how to care for animals on their small farm. Jane turns out to be a very responsible and hard-working young girl. She works hard to keep her promise to her biological father to get an education while accepting and loving her new father, adapting to her new life and learning new things. It’s a story of growing up, learning and adapting to the many changes that happen in life that we have no control over – both as adults and children. I thought this story was good; I love historical fiction and have always had an interest in the Civil War. Since this was a novel in the kids section of the library (my daughter picked it out actually) I read it to the kids most nights or afternoons before dinner. They enjoyed the book too, but thought the book had some boring parts. Although most of the book was interesting to me, I could see how some parts could be boring for children to read. Like so many of the other books I’ve enjoyed – this book had some funny parts like when Jer and his friend, little Jimmie Lincoln, started fighting over their breakfast food (my son’s favorite part in the book). My favorite part in the book is when Jer first calls Mr. Wright “daddy’ and when Jane decides it’s time for her to do the same. It’s a good book that would go well with a history lesson about the Civil War and/or American History. I would recommend this book to any parent who home schools their children especially if they have a 4th-5th grader. I recommend it to any kid (or person really) who is curious about the Civil War (like myself) or U.S. History. 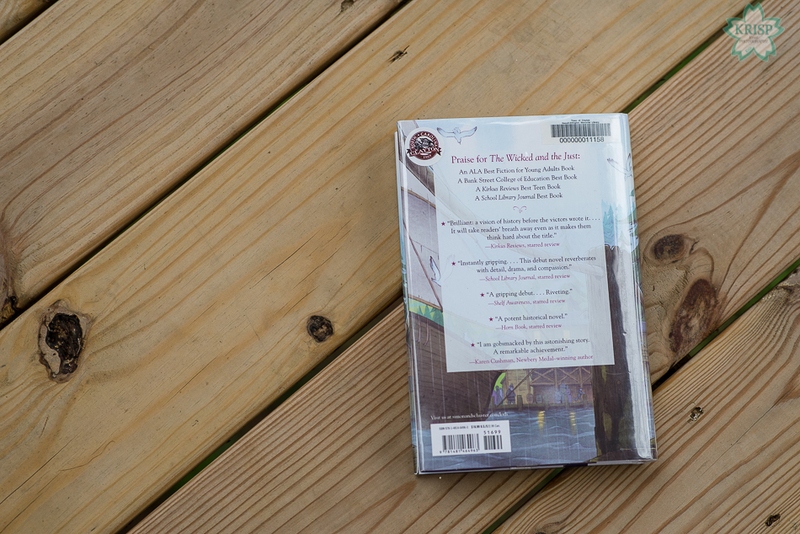 Fact checking historical fiction novels is a fun way of tying literature and comprehension and history together. It is also a good way to review or learn facts about historical events. 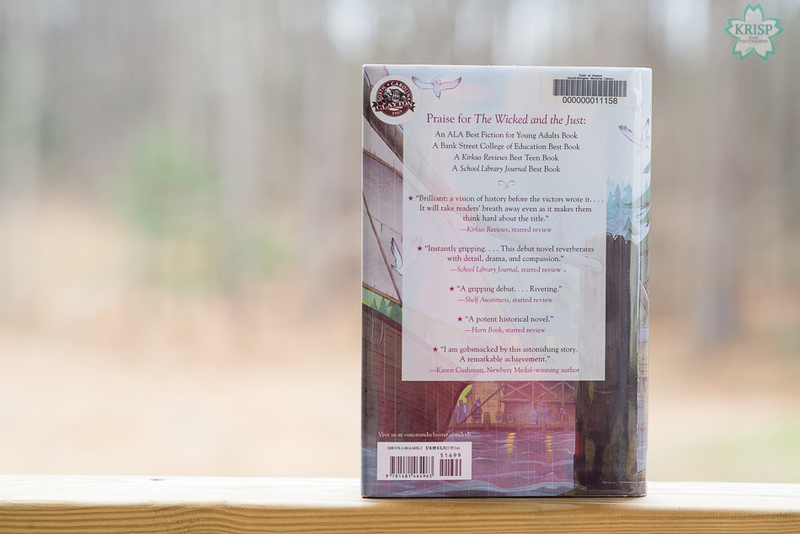 We checked this book out from our library, but if you’re considering buying a copy like I am, you can purchase a hardcover copy at Amazon for $14.29 (a Prime item too!) or you can purchase a paperback reprint copy at Barnes and Noble for $7.99 (the hardcover copy is for schools and libraries only and costs $18.40). Thanks for stopping by to read my book review. Don’t forget to check the others by heading here and come back next Friday for another book review!